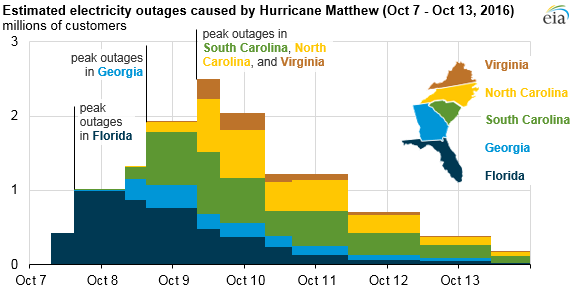 Hurricane Matthew resulted in temporary electricity outages for millions of customers along the southern Atlantic Coast. Matthew was a Category 3 hurricane when it hit the east coast of Florida, just north of the St. Lucie Nuclear Plant, on Thursday, October 6. The hurricane traveled north along the Florida coastline, and by Saturday, October 8, it had reached South Carolina and continued its track along the coastlines of North Carolina and southeastern Virginia before heading out to sea. Total outages reached their peak level on October 9, with roughly 2.5 million residential, commercial, and industrial electricity customers without service across five states. 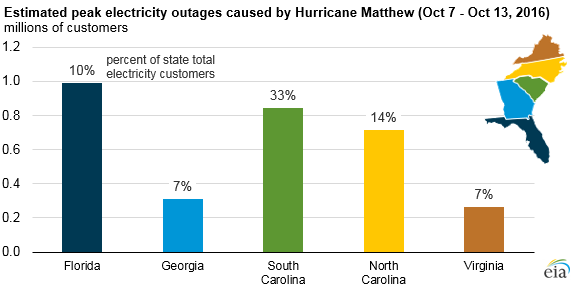 In absolute terms, Florida sustained the largest peak outages during Matthew, with nearly one million customers, or 10% of all electricity customers in the state, without service. South Carolina’s outages peaked at more than 800,000 customers, representing one third of the state’s total customers. One nuclear unit at the St. Lucie nuclear plant on a small island off Florida’s east coast powered down in anticipation of Hurricane Matthew. St. Lucie already had one unit shut down for refueling when it powered down its other unit. St. Lucie and the Robinson Steam Electric Plant in South Carolina each issued a Notification of Unusual Event, the lowest risk level a facility can enter into under the United States Nuclear Regulatory Commission’s (NRC) classification system. Under federal law, nuclear plants are required to shut down at least two hours before the impact of hurricane-force winds of 72 miles per hour or greater. Nuclear plants must also shut down if they lose offsite power. Both Robinson and the Harris Nuclear Plant in North Carolina temporarily lost offsite power. Robinson shut down, but Harris was already down for scheduled refueling. Daily outage status for all nuclear plants in the United States is available through EIA’s Status of Nuclear Outages page, which compiles data from the NRC. For nuclear power plants that shut down under an emergency event, the process to restart the plants requires inspection and approval from the Federal Emergency Management Agency (FEMA) and final approval from the NRC. Once a plant receives those approvals and restarts, it can take 72 to 120 hours to reach full power. During fall and spring, many nuclear plants go offline to refuel and perform routine maintenance. These nuclear plant shutdowns occurred during a time of seasonally low electricity demand, when moderate fall temperatures reduce demand for air conditioning and temperatures are not yet cold enough to require heating. 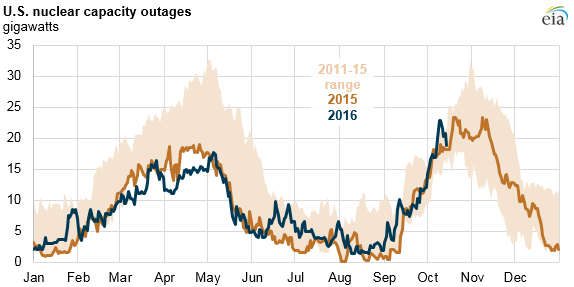 Nationally, nuclear outages were briefly higher than the previous five-year range for that period immediately after the storm, but they have since returned to typical outage levels.